so when winter rears its somewhat ugly and harsh head with cold blustery conditions and toe-freezing feels-like-absolute-zero temperatures, there is an upside: ponds, water sheds, and ice surfaces everywhere are freezing. Outdoor rinks come in different shapes and sizes but all offer a skating and hockey experience one cannot help but enjoy. And enjoy it we do all across Canada. A new addition to the Toronto area is the city’s first ice skating trail. A project that was first dreamed up way back in 1996, construction finally got underway last year and the trail at Colonel Samuel Smith Park opened this week! A change from the usual more hockey-oriented rink design, it is all about rec skating around a figure-8 loop that’s 250m long. It is made with artificial ice for ease of maintenance and a lighting and sound system is integrated amongst a natural park setting full of trees. Sounds neat. 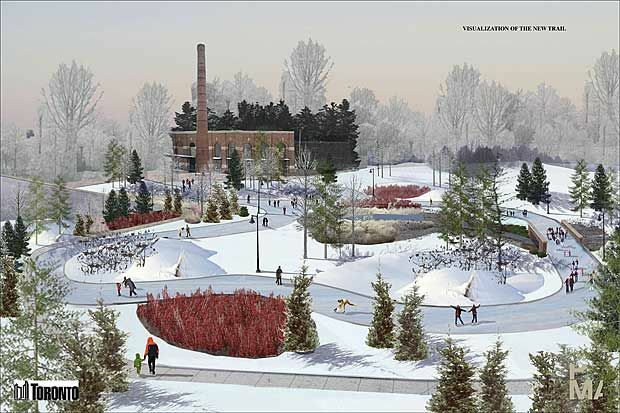 That new skating trail is just another addition to the over 50+ rinks in the city. Outdoor rinks continue to rise in popularity in towns around the GTA as well. 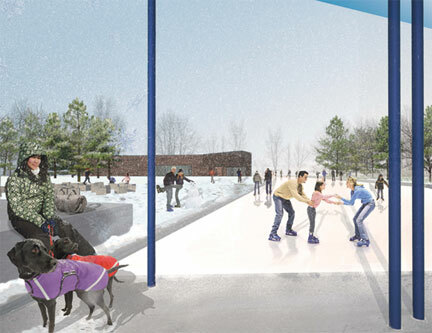 To the north, Newmarket’s long-planned downtown community urban space project (CUSP) includes a skating rink plan. In a town that boasts a long-standing vibrant hockey and figure skating community, it has been slow to embrace outdoor rinks. Unlike rival Shelbyville that has a whole section on its town website dedicated to the handful of publicly maintained outdoor rinks and skating sites. Again, being Canada, it’s not that hard to find a pond or strip of ice that some kids have shoveled off and started a game of shinny(you just have to look at google maps, or drive around). Toronto’s famous spots like Nathan Philips Square and Harbourfront Centre are already hopping with regular activity for winter as well. Again some wisdom of Molson Canadian marketing, “we know we have the best backyard in the world and we get out there every chance we get.” So get out there! What do you think of the new rinks?